iSpy keeps track of the activity detected during recording and exposes this information in activity graphs. These graphs are available on a per-recording or based on the full list of files that result from your search criteria. The red points indicate motion that falls above the motion triggee and the black is motion that isn't enough to trigger the motion detector. 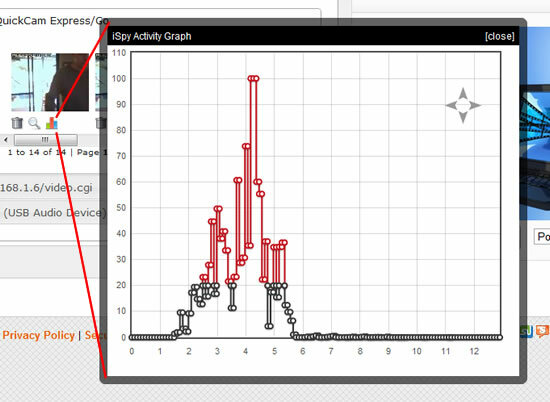 Clicking to view the activity graph for the camera or microphone itself shows the graph of maximum trigger values over the defined date range. You can mouse-over the data points on this graph and iSpyConnect will display the full resolution preview image for that recording (click it to play the associated video or audio).